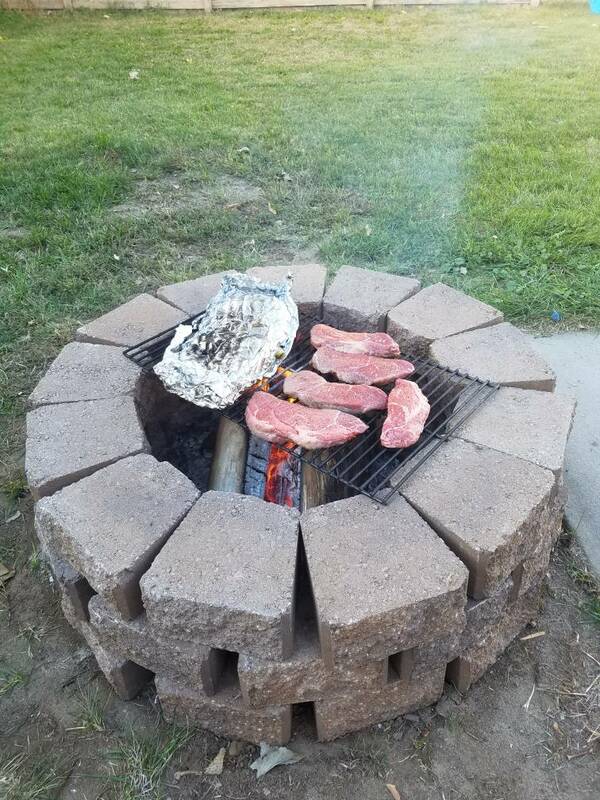 Grilling steaks and potato wedges over my relatively newly-built fire pit. Turned out ok. Should have flipped them a little earlier than I did - got more charring than intended on parts of the steaks in the middle. Also should have cooked the potato wedges longer and/or hotter. The pineapple wedges turned out well. not a fan of grilled steaks. cast iron. Sorry. Didn't mean to assault your sensibilities by cooking with fire. Steak is reason enough alone for me to never become a vegetarian even if that would prolong my life. Anyone have a tried and true method for steak and eggs? Hamburger is also made of 100% beef. You can also find all-beef hot dogs at the market. Use those for your open-fire grill. But don't throw raw steaks on that thing; it's an abomination and one of the end-of-days signs predicted in the BoM. Instead, follow the prophets... prep your steaks sous-vide and finish them on the grill (if the coals and the grill are sufficiently hot... as OG notes). I smoked a bunch of meat for lunches this week at a fairly low temp (225). I threw a tri-tip in for dinner and left it on the smoke a little too long. To my surprise, it was well done, but also really tender, moist, and delicious. I love this thread already. Pelado, you're awesome. I appreciate your sustaining vote. I tried a new experimental beef recipe last night that turned out really well. My goal was to make spicy Mexican-style pulled beef that I could use in tacos or as a topping on things like nachos or serve on a bun. I pulled a nice sirloin roast out of the freezer and cubed it into inch and a half to 2" squares. I threw the cubes into a cast iron roasting pan and then covered them with the sauce and cooked at 275 for about 3 1/2 hours. For the sauce, I took some jalepenos, vinegar, cumin, oregano, garlic, salt, pepper, onion, and a couple cups of water with bullion cubes and threw it in a blender. After blending I poured it over the meat before I put the meat in to cook. Once the beef got tender enough to pull, I took it out and shredded it, then put it back in the roasting pan to cook for another half hour so that it would soak up the sauce. It was fantastic, but my kids thought it was too spicy by itself. Once you turned it into tacos or nachos, it still had some heat, but was mild enough for even the young kids to eat. The leftovers I mixed with some Mexican rice and put it in individual serving size ziploc bags for lunches. All in all it was one of my best cooking creations in quite some time. I'll definitely make it again. Next time I'll either smoke the jalepenos ahead of time or maybe use some chipotles from a can. I think the added smoke flavor would add some depth to the meat. I didn't think to take photos since I don't have a habit of instagramming my food. If I do it again, I'll document with photos for those interested. I'm doing 4 top rounds in the sous vide. Standard 24 hour cook time @ 128°. 1 for dinner, 3 for sliced sandwich meat. And wash it all down with diet Mtn Dew. Do you sear those when they're done in the sous vide, or is that only for steak? Will sear the one we eat. The three destined for sandwich meat will go straight into the fridge and be sliced up after they have chilled. i would still sear it because the grey color is gross. Will post a pic of the stack of sliced sous-vide beef tomorrow (maybe); trust me, you can't tell if the beef is seared or not after you slice it that thin (so thin you can't even see it!). But first I need to even up my wife's high heels. 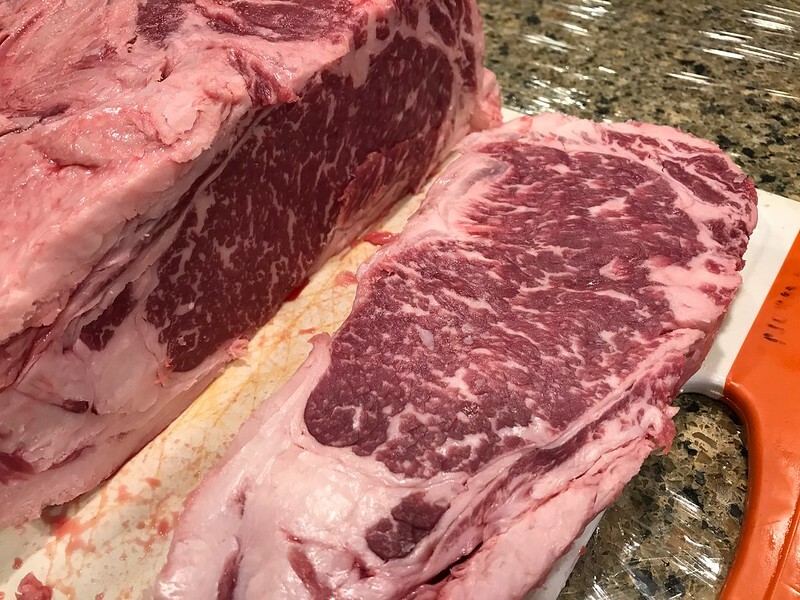 Lately Costco has been selling USDA prime loins for $9.99/lb with $25 off per package. For a 15 lb. package that works out to around $8.33/lb which is a ridiculous price for prime grade. I bought a package yesterday and cut into NY strip steaks. It is legit prime grade. Made 15 steaks. 3 are going in the sous vide today and the rest are vacuum sealed and are going in the freezer. Cowboy, why are NY strip steaks so cheap lately? Shhhh!!! Don't spoil it. We've been getting nice thick steaks lately that cook up so tasty. That would make an awesome stir fry! A couple of things are going on. First, cheap feed and lower prices are encouraging feeders to feed cattle longer and heavier. Heavier cattle are more likely to grade choice and prime, so there is more meat on the market, and more choice and prime meat proportionally. Second, this is seasonally a time when middle meats (Ribeye and Loin) decline in value because the grilling season is over, as a rule, after Labor Day. Loins are particularly hard hit because Ribs are a dual purpose primal that is popular as a prime rib roast as well as a ribeye steak. This is evident in the cutout (wholesale beef price) that has dropped around 32 cents since June. By primal, though, the chuck and round, which are ground in the summer and sold as pot roasts and stew meat in the fall and winter, have declined only 10 cents and the value of the rib and loin have decreased by 40 cents and 70 cents respectively. Finally, retailers are making more on beef than they ever have, so there is room to run on features for particular cuts. The wholesale value of beef is around $1.95/lb, while the weighted average retail value is $5.78. The cutout shows that packers are pricing loins to move - the average wholesale price for a loin is $2.40, which makes prime loins around $3-$3.50/lb wholesale. Retailers and probably buying the hell out of them at that price, taking a normal or slightly less than normal margin, and then featuring them as a sale. Retailers still make money, and consumers feel like they're getting a great deal because margins are so high on the other cuts. After cutting the steaks, I had a big chunk at the end of the loin so I vacuum sealed it and froze it in one big piece. Today we made it into a pot roast. It was incredible. So a USDA prime loin pot roast. High five to Katy Lied! I bought four chuck rolls at Sam's Club for the Day of the Dead event tomorrow, and I got them for $3.37/lb. Beef is cheap right now. I was gonna just do half-assed al pastor, but with beef that cheap, we're gonna have some carne mechada legítima mañana. Shout out to KatyLied. 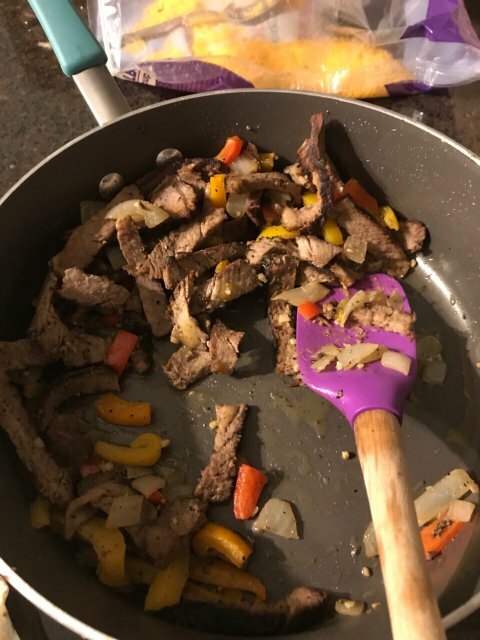 MJ made fajitas out of prime steaks we got from Costco. To be fair, we grilled the steaks on Sunday so they are leftover.